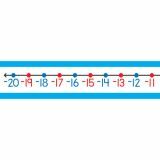 This Number Line Bulletin Board Set supports Common Core State Standards with 14 number line strips with numbers ranging from -20 to 120. 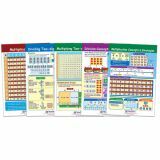 Math manipulatives at a price you'll love, curriculum based cut-outs are a must-have for your elementary classroom. 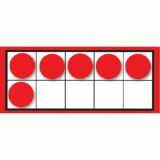 Ten frames are a great resource for teaching and practicing counting, addition, subtraction, and beginning place value. Curriculum Cut-Outs can be used during center time, group work, or individual work or when students have completed other tasks! 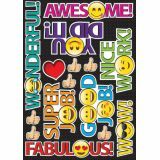 Write-on/wipe-off magnets punch out from 8-1⁄2" x 11" sheet. 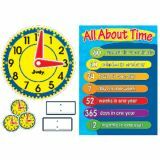 The Gallon Man Bulletin Board set makes teaching measurements easy and fun! 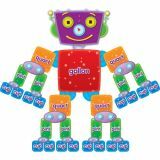 Includes 50 pieces of colorful, bright fun accents to "build" the Gallon Man while teaching liquid measurements! Also includes two charts which displays liquid measurements in a fun and engaging way! 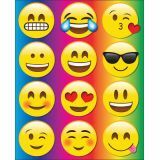 Perfect for any math or science curriculum and as a year-round reference for any classroom! 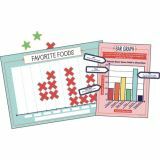 An interactive graphing bulletin board set provides an easy way to appeal to visual learners! Year-round visual references reinforce essential standards-based concepts and help students succeed in the classroom. Using a bulletin board to teach graphing is a great way to make students feel like they are part of the learning process—and it's fun for all! Be sure to browse other subject-specific sets for more interactive ways to learn. 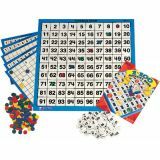 Groups of twos or threes can use these versatile hundreds boards for everything from math games to graphing. Dry-erase markers let students correct mistakes or begin a new activity with ease. 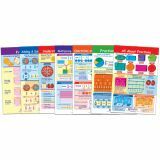 Two-sided 11" x 11" cards provide 1" number squares from 1 to 100 on one side with blank grid for patterning and graphing activities on the reverse. “Write-on/wipe-off” charts are ideal for classroom reference or student activities! Graphic images and hands-on activities provide comprehensive coverage of essential student skills and are developed to cover the current state and national standards— including Common Core! 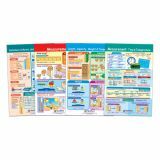 Each 12" x 18" chart is laminated and double-sided—Side 1 features a graphic overview of the topic; Side 2 provides “write-on/wipe-off” activities.